Can something with sausage in it still be called a salad? I think yes. 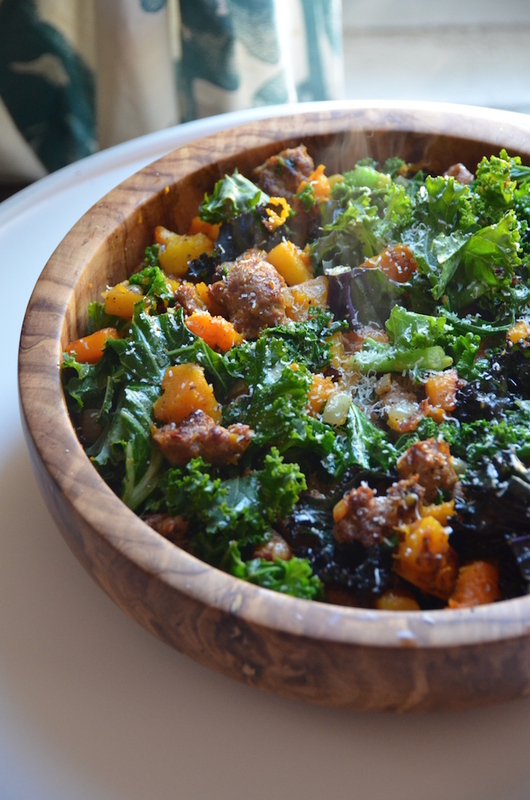 This Warm Kale, Sausage & Butternut Squash Salad needs to happen in your kitchen soon. It's the kind of dish that's supposed to be a side, but which can totally satisfy all on it's own. It's a good weeknight dinner. It's a great weekday lunch. I know, because after I took these photos, I sat down and ate the whole thing. The whole time I kept thinking that I should stop and save some for Eugene, but then there was none left to save. This dish cooks all in one pan. You start with the sausage--obviously. I like a spicy Italian sausage, but use your favorite--turkey, chorizo, heck...even soyrizo if that's your thing! Saute until brown, then add the squash and let that cook. The kale is last, along with some seasonings--salt, pepper, a little balsamic vinegar--and a bit of grated cheese, if you'd like. Into a bowl, then onto a table. Or if you cook it in a pretty cast iron pan, it can go straight from stove to table. Heat olive oil in a large skillet over medium-high heat. Add the sausage and brown for about 5-7 minutes. Add the butternut squash and onion (and a bit more oil if there isn't much fat in the pan--this will vary based on the sausage you use), and cook for about 10-15 minutes, stirring occasionally, until the squash is tender. 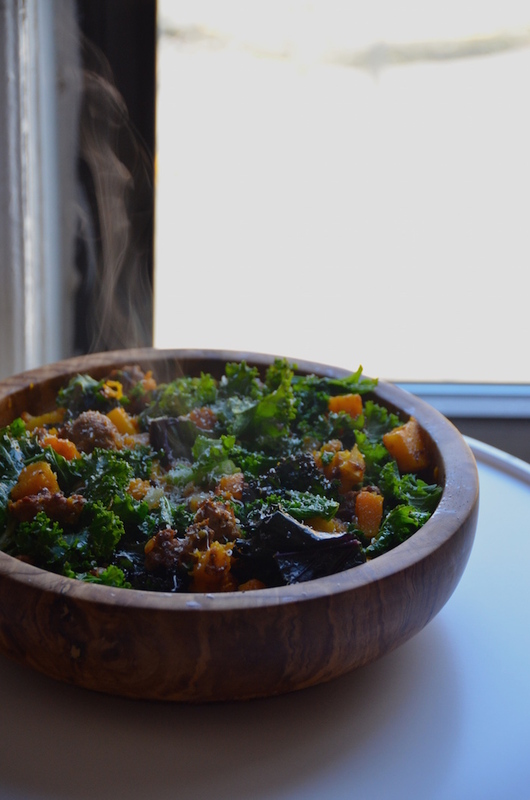 Stir in the kale, letting the heat from the pan wilt it slightly. Remove from heat and season with salt and pepper, to taste. Transfer to a serving dish, drizzle with balsamic and sprinkle on the parmesan. Serve immediately.